The 1 kg 2019 Lunar II Year of the Pig silver coin celebrates the final instalment in the Perth Mint's massively successful Australian Lunar or Lunar II series. Struck from .9999 fine silver and featuring a reverse design based on the characters of the ancient Chinese calendar, Lunar II series silver coins are an excellent investment. Buy yours today with CoinInvest. This large 1000 g coin measures 100.60 mm in diameter, enabling you to fully appreciate its magnificent design features. The coin's reverse shows a female pig standing under a branch with her snout raises as her piglets play by her feet. 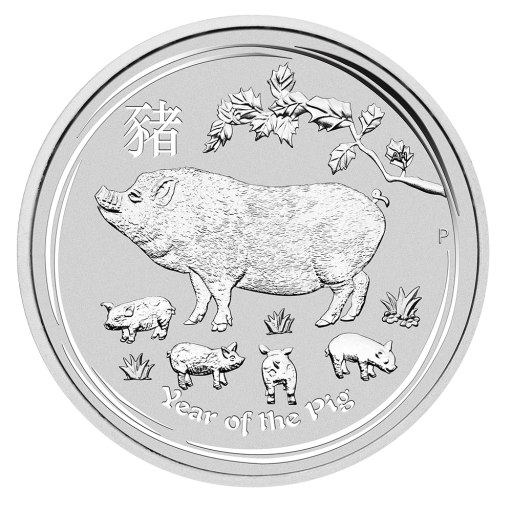 The Perth Mint's 'P' mintmark, the Chinese pinyin character for 'pig' and the inscription 'Year of the Pig' complete the design. The coin's obverse carries the Sir Ian Rank-Broadley portrait of HM Queen Elizabeth II along with the year of issue and the coin's weight, fineness and denomination. 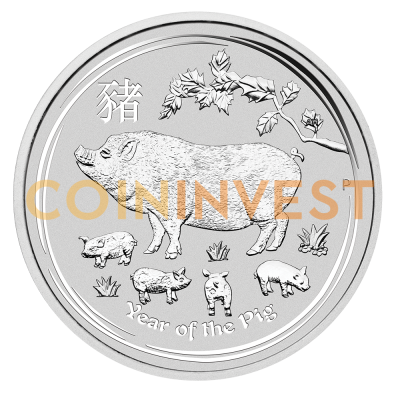 coininvest.com is delighted to present the 1 kg 2019 Silver Lunar II Year of the Pig coin. These superbly crafted coins can be purchased singly in plastic capsules or as multiples of 10 packed in card.